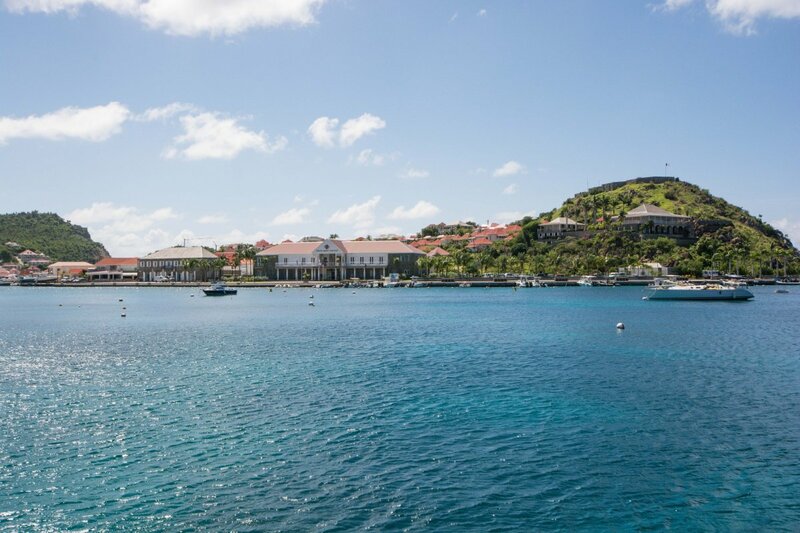 Gustavia is St. Barths hometown, the main harbor of arrival for those in yachts and ferries arriving from St. Martin. Coming in from the rough open sea is an experience, the water is beautiful, a gorgeous aquamarine that’s Caribbean clear. Pulling into the port you’ll notice its tidy appearance, with some large colonial-looking buildings on one side a row of tidy shopfronts on the other, the main street or “high street.” As you get closer, you’ll start to notice some familiar names. Bulgari, Cartier, Prada, Hermes, they’re all there, lined up like a mini 5th Avenue. 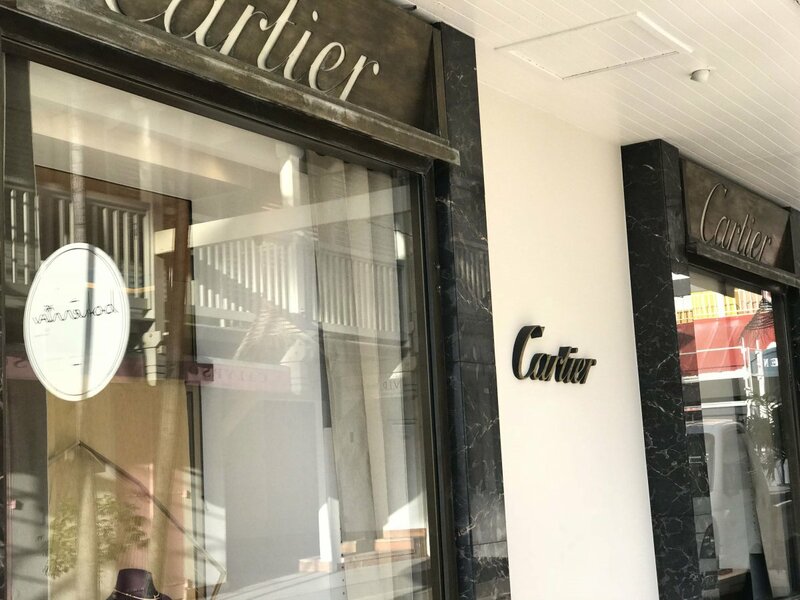 All the luxury shops are exactly what you might expect to find in this storied place. However, for us, the real charm of this town lies in the quiet streets behind the shops, in the little bars and restaurants where life happens. 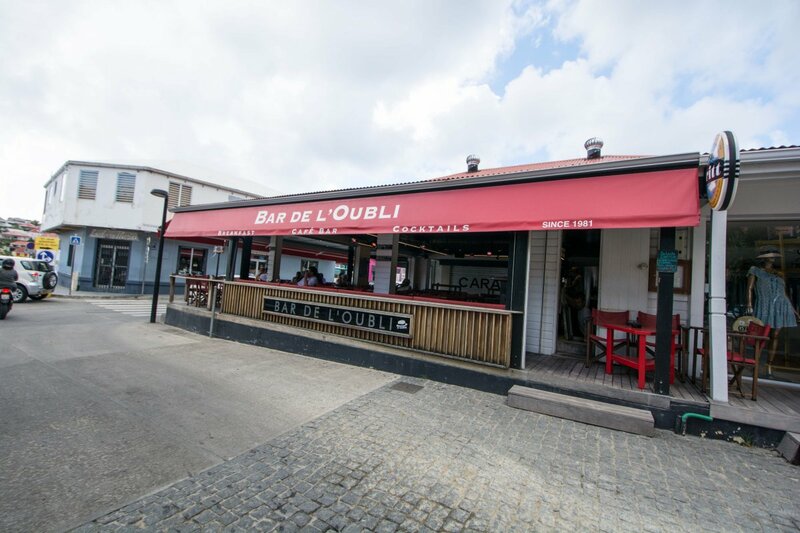 We enjoyed good meals and bars here in Gustavia. Out of all the bars and bistros, this rustic bar has been around the longest. The sign says since 1949 and there is a definite shabby-chic sailor vibe in this one-room garage of a bar. Everyone comes, or ends up, here during a stay and it’s easy to understand why. It’s got the patina of a classic spot, a place for titans of industry and local people to tie one on. As a Brooklyn expat, this place reminded me a lot of an old restaurant called Robin Dubois, filled with memories of many a dizzy evening, pastis and other booze at the ready. You can order burgers and fast food here and dine out on the patio, on the plastic chairs, like everyone else. A good place for a cheap snack on this otherwise pricey little island. This bar is just across the street from Select and has corner charm. It has that classic French bistro look, with a great awning and a perfectly lit space that is open to the street. It is inviting and certainly draws a crowd. There’s plenty of booze, with a more traditional French bistro vibe. We asked if they had a pilsner or a Stella, and the bar tender simply replied “No," and that was the end of that, there was nothing else offered. After some further querying we were served a Carib, the ubiquitous cheap, local light beer, sort of like Corona in Mexico. We drank this beer a lot in St. Martin and St. Barth. We ended up at Quarter one night after wonderful dinner with local friends at Bonito, a trendy restaurant just up the street. This is a bistro with eclectic Asian and regional tapas bites, however, we didn’t dine so we cannot comment directly on the cuisine. Reports are the food is quite good. The bar, on the other hand, was hopping. There was a trendy barman and plenty of excellent cocktails to be enjoyed. The restaurant and bar staff were very welcoming and fun. The crowd was a mix of locals and visitors. 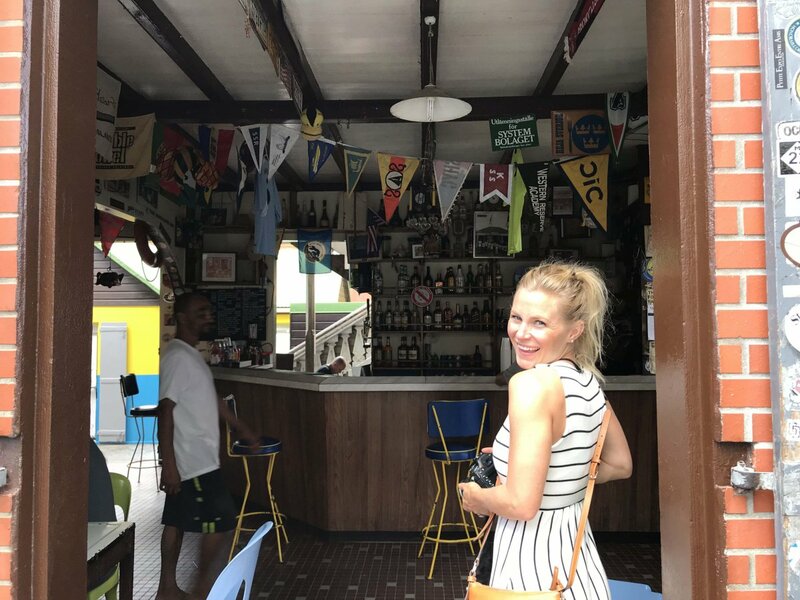 If you are in St. Barth during the season, you will likely find your way to this fun place at least one night. This bar has a secret as well. We love bars with secrets and we’re not telling. Email for reservations: hello@25sbh.com. American Express is not widely taken here, so be prepared to bring another card that does not have foreign transaction fees, or take money out of the ATMs. The currency used in St. Barth is the Euro. We had our own villa, of course, during our stay on St. Barth, so we enjoyed eating at home on the gorgeous patio of our villa, which overlooked a rough ocean beach. However, we did dine at several good spots in Gustavia during our stay on St. Barth. One of the places we ended up dining at fairly often was Le Repaire, located just across the street from Gustavia Harbor. The reason we dined here was out of convenience more than anything, but we kept coming back because the food was consistent, the pricing reasonable, the location central. Moreover, it is always open, even on Sundays when the entire town closes shop, you’ll be able to have a meal here. 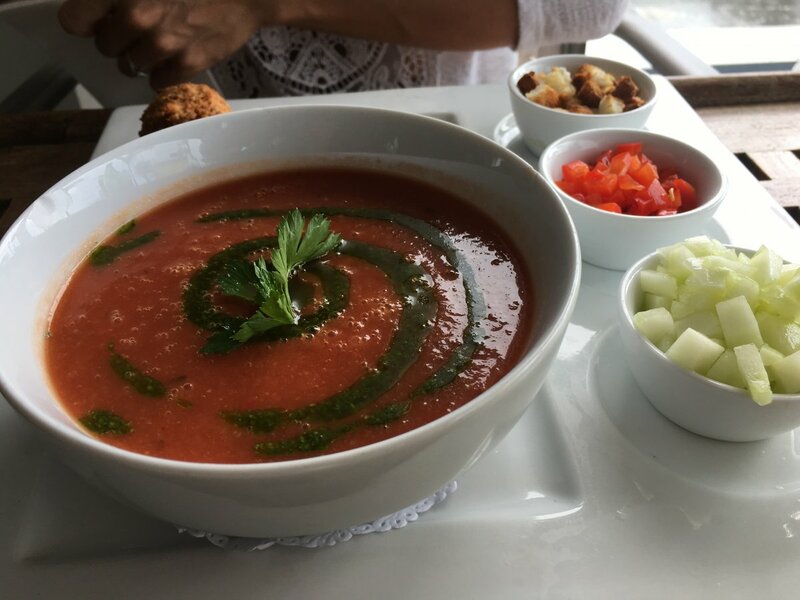 The gazpacho soup below was delicious. You can phone them for more info at +590 590 27-7248. 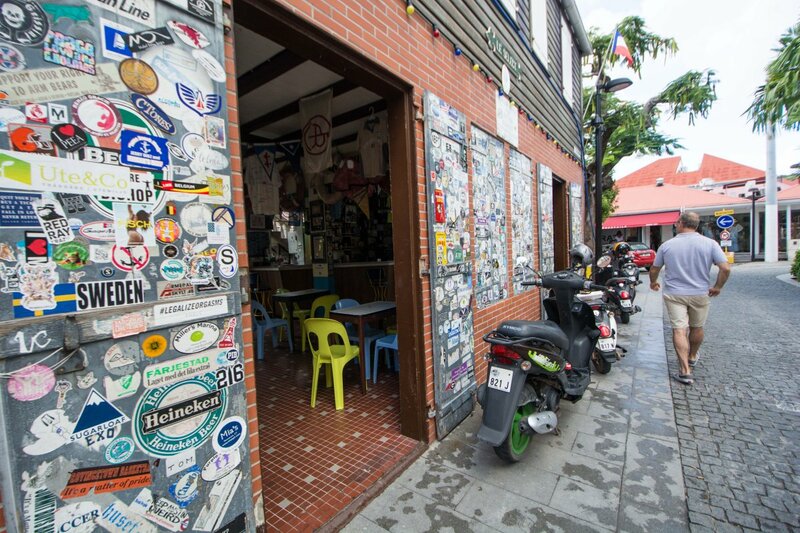 This is a great little place tucked behind the main drag in Gustavia, near Bar Del L’Oubli. If I had to pick a favorite spot for food, it would be Fish Corner Food and Market. It’s small and serves up fresh local catch each day. There are large local fish on ice as you come in and you can just tell that the food is going to be superb. 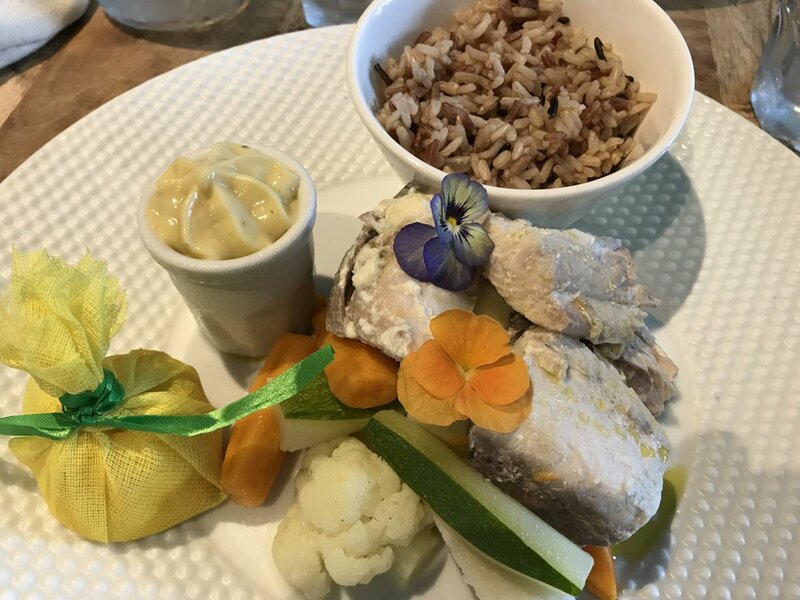 We enjoyed local catch, which was cooked and presented beautifully, and had one of the best lemon meringue desserts we had ever tried. This is a wonderful little spot for lunch, but it will be crowded. You can message them on Facebook. This is an island favorite, a charming spot that has a feel very Hamptons feel about it. In fact, there were New Yorkers all around us. We enjoyed mainly fish here, and they are known for their ceviche, which we enjoyed. We also shared roasted octopus and tacos, the Mahi Mahi, and we have it on good authority that the beef tenderloin is quite good. This is a one of the trendier dining spots in town and it’s easy to understand why, the atmosphere is beachy and warm, and the service is great. We did not have time to dine at L’Isola during our stay, but it was highly recommended by locals as the best restaurant in town. This Italian restaurant is housed in a small house-like building in Gustavia. It’s very unassuming and simple on the outside, and we are told that the interior is upscale, and the food is superb. Unlike Bonito and other restaurants, this restaurant is not open to the air, which is something to consider if you are looking for a more Caribbean ambiance. You can view more on their website. Getting to and from your villa (or hotel) and the restaurants in Gustavia will involve driving. Beware that the roads are narrow, and the people here drive the way they do in France and Italy, meaning a bit aggressively. Cars wiz by you inches away. There are few named roads here outside of the main town of Gustavia. Interestingly, there are no real addresses – each house has a name. You get used to it quickly, but it’s difficult to map an address for a villa. Therefore, be careful to recognize landmarks and driveways, as we did not pay attention on our first day and returning home at night was a bit of a challenge – all the driveways looked the same in the dark! Luckily the name of the villa was written on one of the mailboxes at the end of the drive and we were able to figure it out. This is a common occurrence with villa renters here. Very often, the villas are located up steep, narrow drives, off which are several homes. This means that turning around or simply turning out of your driveway can be tricky because sometimes you cannot see what’s coming around bend. Somehow it all seems to work out, but this is not an island for the faint-at-heart driver. You’ve got to be comfortable behind the wheel. The views below are worth the payoff, but you can't take an elevator when you rent here! The rental car of choice here is the Mini Cooper. You see them everywhere as they are small yet allow for a little storage for shopping and beach trips. There are also some cute little electric-type buggies, and these look like a handy way to get around the island. The postman basically knows a villa/cottage or the residents on the island, so s/he will deliver the mail old-school village style, e.g. oh this is Jean’s parcel. Also, residents will go online to see if something arrived in the post office with their name on it and go down and pick it up – St. Bart’s chill chic at your service. 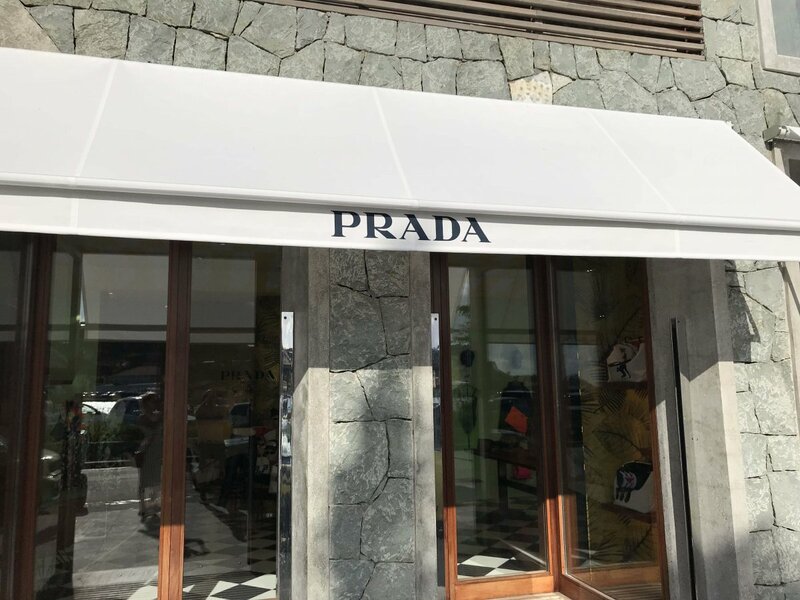 European Business Hours and Sunday Shutdowns – St. Barth Villa Renters Beware! The last thing we will advise is American visitors is to be conscious of the European business hours. Many stores will open in the morning, close for lunch and then open again in the afternoon. However, beware of Sundays, as it can be difficult to find anything open, including restaurants and bars. St. Barth asks you to please relax and enjoy an unhurried day on Sunday, and we think it's a great idea. You just will want to pick up groceries, water or any other item you may need on Saturday! 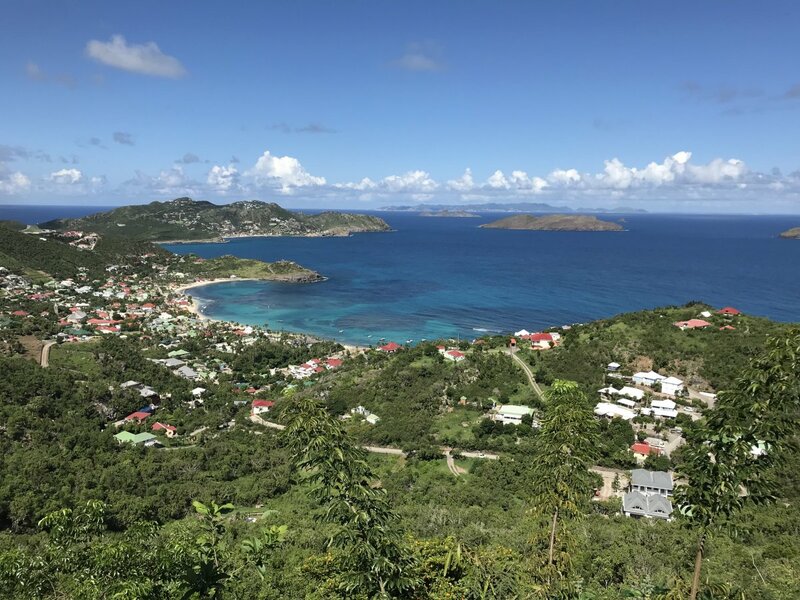 Check out Exotic Estates St. Barth villas and plan your escape today!